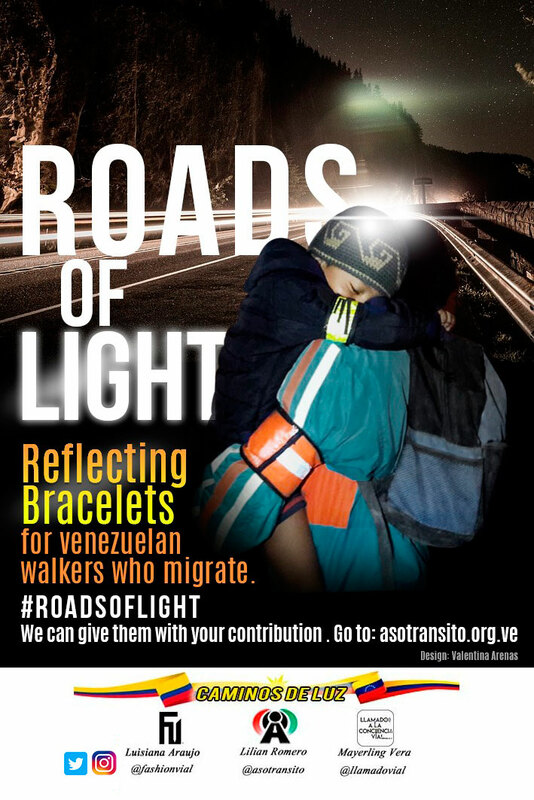 Through the strategic alliance between the Asotransito, Fashion Vial y Llamado a la Conciencia Vial, we seek to support Venezuelan migrants who are crossing the border of different countries by foot, through the delivery of a ribbon / bracelet (for adults and children ) made with fluorescent and reflective materials with compartments for any document held by the migrant, it is intended for the citizens to be visible for drivers of Colombian roads, and thus avoid traffic accidents due to lack of visibility. Every day tens of thousands of Venezuelans cross the border with Colombia, which has been a host country and passage for millions of them, on the other hand, a large part of these people undertake long walks on Colombian roads to get to Ecuador, Peru or other southern countries, all this according to testimonies in search of opportunities and a better lifestyle. Not all Venezuelans who enter Colombia stay, many of those who arrive in Cúcuta walk along several roads to the border of Ecuador to emigrate to that country or to Peru or Chile. Therefore, it can be said that crossing part of Colombia on foot is a challenge faced by dozens of Venezuelans who, without transportation money, venture from the Venezuelan border on the roads to the Colombian territory to reach cities in the interior in search of work. 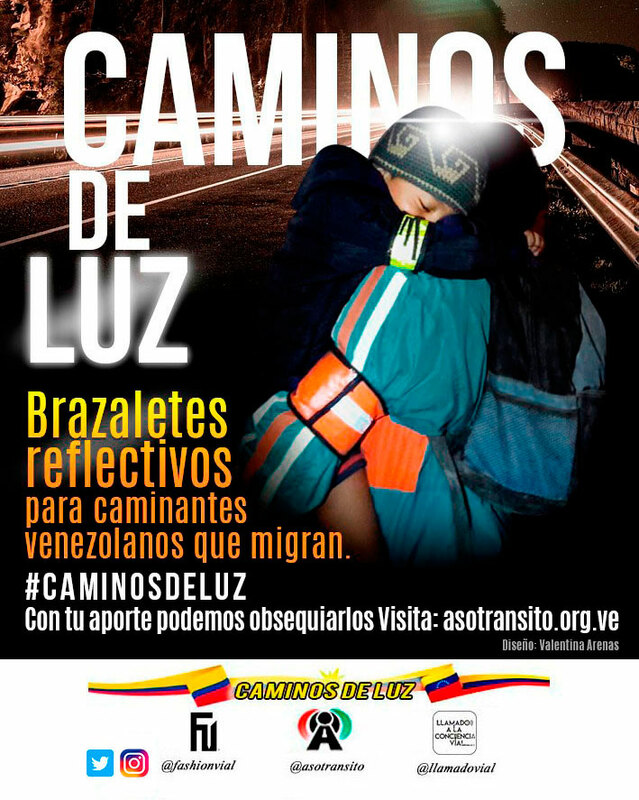 According to investigative journalism, Venezuelans declare long walks during the day and even at night reaching late hours of the night by long stretches of road and highways without much lighting and high risk areas, as they are fast roads structurally unsuitable for pedestrians, adding unfavorable climatic conditions, both for health and visibility, reinforces the need for reflective clothing in order to avoid or reduce the risk of a road accident. UN statistics indicate that about 2.3 million Venezuelans have left their country in the face of the crisis that they are living there. 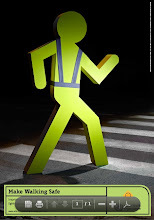 It is necessary and indispensable to offer visibility to walkers and thus reduce the possible risk factor in a traffic accident, taking into account the vulnerability of these people due to fatigue, inadequate and in some cases precarious feeding, as well as the climate factor and the emotional instability before an uncertain future. Asotransito, Fashion Vial y Llamado a la conciencia decided to activate ourselves with "Camino De Luz" or “Light Path”, for this we need your collaboration to achieve in the initial phase 1000 reflective bracelets that will be delivered in Pamplona-Colombia, which is a strategic site to attract the migrant from walking. We need to raise $ 5072 to cover all the manufacturing and logistics expenses of the project. For the manufacture, imported materials are required, which are not available in Venezuela. Regarding the logistics of the project, there will be a donation day of necessary clothing for these migrants, such as sweaters, shoes and food. We need to make 1000 to start and we know they are few, but we also understand the complication in getting the money necessary to start production. In Venezuala in July, inflation reached 83,000% and prices for food and everyday items are doubling approximately every 26 days. Many public services, including bus and train services are shutting down, and citizens are struggling to meet household expenses. 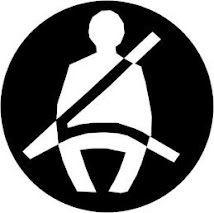 The crisis is having a devastating effect on road conditions and subsequently on injuries and fatalities. Road infrastructure is deteriorating with no money available for checks and improvements meaning that the roads themselves are less safe. Spare vehicle parts, including tires, are difficult to get hold of. This has two effects: one is that unsafe vehicles are being driven, the other is that less people have enough money to run a car and therefore more people are walking or taking public transport. 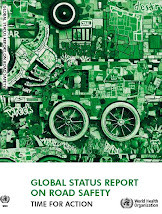 More people are using public transport but less public transport is available. Bus operators are among those who are unable to obtain spare parts for their vehicles and are unable to pay their drivers enough as living costs increase rampantly. As a consequence, buses are overloaded with people hanging from the sides and bumpers. The elderly and vulnerable are worst affected because they do not pay bus fares, so bus drivers are not motivated to stop for them. Where public services are failing, some people are seeing an opportunity. Private trucks, known as “kennels” because of their resemblance to animal transporters, have begun to operate as unofficial buses. Not only are the authorities turning a blind eye to this, but some city councils have acquired cage-type trucks themselves, which are being used as public transport. These makeshift vehicles are causing an increased number of crashes, injuries and fatalities. The lack of public transport has forced more people to walk. 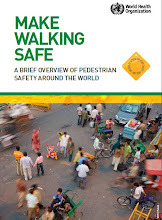 While, this could be seen as a favorable step, however, in this formally car-based culture, many streets, especially in the interior of the country, are not set up for pedestrians and lack signs, sidewalks, crossings, and lighting. Alliance member NGOs in the country are working hard to address the increasing issues with limited resources. Asotransito are campaigning hard with the government to prioritize safe roads and transport even in the face of multiple issues. They are also taking practical low-cost action. The project #CaminoDeLuz, meaning “path of light”, seeks to distribute fluorescent and reflective bracelets to those forced to walk on badly-lit streets, including the thousands of refugees walking long distances to cross the border into neighboring Colombia. The bracelets can be seen by drivers 250 meters away and alert them to slow down to avoid pedestrians. Asotrotransito is seeking funding from international donors to extend the project. Today, we want to recommend to those who come to this blog, the newspaper article The Signey Mornign Herald who present a very interesting reflection of how possibly "bloody" campaigns as an attempt to catch the attention of public road users, are not so effective. Los niños de todo el mundo inspiraron esta Declaración Niño. Ellos expresaron sus pensamientos y temores acerca de viajar en las carreteras. Dijeron que lo que necesitan para mantenerse seguros en las carreteras. En un esfuerzo conjunto, los expertos del mundo también esbozan medidas que se deben tomar. Juntos hacemos un llamado a los tomadores de decisiones en todo el mundo a tomar medidas y proteger a los niños. Salvemos Vidas niños. Lea la Declaración de Niños para la Seguridad Vial. Cada día más de 500 niños y niñas pierden la vida en accidentes de tránsito en todo el mundo. Miles de personas están heridas. Apoyo a la campaña firmando la declaración. 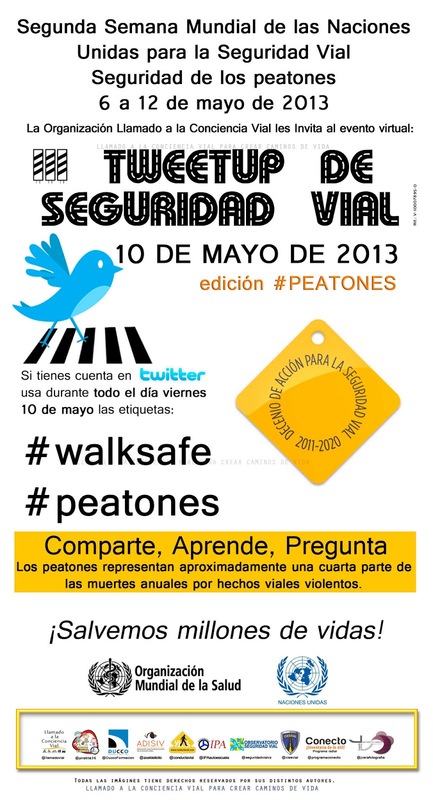 Juntos vamos a hacer un llamado a la acción sobre la seguridad vial! 2- Tweeters must not write disrespectful or hatred messages nor post gore images, or make unfounded accusations. They must always respect local laws even in cases of perpetrators of violent transit accidents. 3- Posting your tweets is a completely free activity, its a citizen´s right and maybe even a duty and they will be the creation of each one of you. Don´t waste this oppotunity to reach the conscience, the heart and the minds of the people and even the authorities. 4- Given that it is a free will activity, you can allow yourselves to be creative, friendly and maybe even spicy with your tweets. Do not limit yourselves. 5- These will be appropriate opportunities to remember friends and family who may no longer be with us because of street transit accidents. International day for Street Transit Victims is commemorated every year on the third Sunday of November and this year will be on the 17th. 6- If you wish to send several tweets, allow some time in between them so you don´t cluster your follower´s accounts and also to allow for them to answer back and make comments on your messages. To find out if someone has indeed answered or commented, go to the upper bar and click on @Conecta. These are simple examples and everyone is free to write up their tweet as they wish. 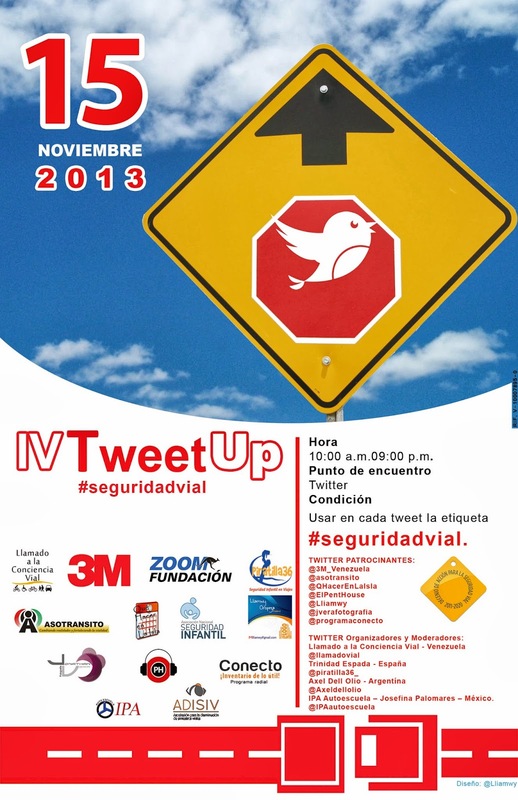 Its a great opportunity to get the local and regional authorities involved and call their attention in your tweets. Give them ideas and show initiatives on the subject or even point out to transit problems in your neighborhood or commute areas. This activity is for everyone and we are all part of the street transit system regardless of wether you are a mother, father, student, a professional, a Kraft laborer, business man, entrepreneur... we are all affected by the anarchy or lack of structure in the transit system both at a financial level as at a emotional level. Our health is affected by it physically and mentally. 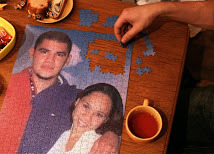 We can also be part of the needed solutions. From 06 to May 12 the week begins UN global road safety for walkers. PARTICIPATE in the TweetUp on May 10 with the labels #walksafe / #peatones a Twitt, an RT is sufficient. in Spanish "Call to the Conscience"